This vegetable combination just epitomizes spring to me. 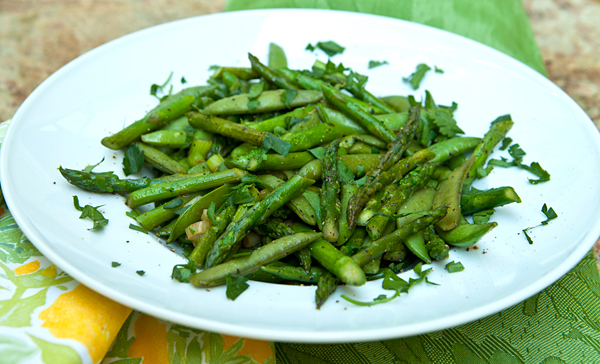 Bright green, with a tender crisp texture, you can throw together this delicious vegetable side dish in under 15 minutes, and this dish would go well with any meat, poultry, or seafood entree. You can vary this dish by adding artichoke hearts, or by adding a finely chopped red chili pepper. 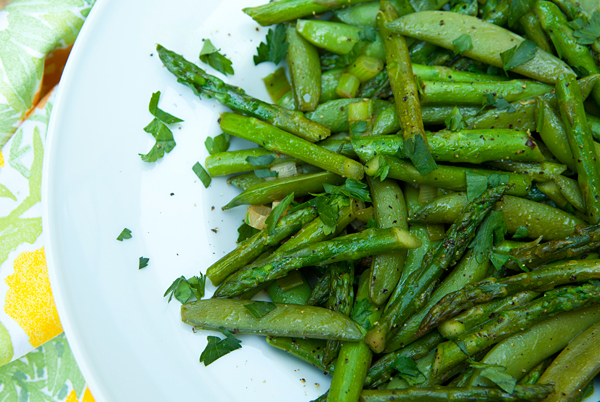 As well as being strong in anti-inflammatory phytonutrients, asparagus provides a wide variety of antioxidant nutrients, including vitamin C, beta-carotene, vitamin E, and the minerals zinc, manganese, and selenium. Sugar snap peas have 150% more amounts of vitamin C than in garden peas, and are a good source of fiber, folic acid, vitamin A, and many other essential B-complex vitamins. Heat the oils in a wok or large wide bottomed pot over medium heat until lightly smoking. Add the asparagus and sugar snap peas and 1 tablespoon of water. Cover the wok or pot, and cook for 5 minutes, shaking the pot from time to time. Add the green onions, soy sauce, salt and pepper and toss to mix. Cover, and cook an additional 3 to 4 minutes or until vegetables are just tender crisp to the bite. Toss with the cilantro or parsley leaves and serve.